When I was a child I used to have "pan con chocolate" (bread & chocolate) for "merienda" (the Spanish name for the afternoon snack after the midday lunch and before the late dinner). It was just a thick slice of french bread with a large piece of chocolate bar inside. It is probably the simplest combination, yet it was delicious. I have discovered that here in The Netherlands they've taken this "delicatessen" :-) to a more sophisticated level. 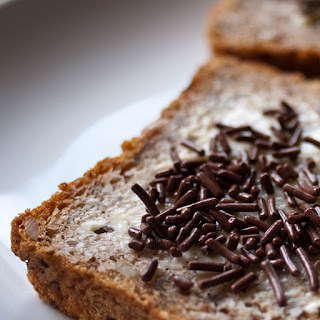 They take a slice of sandwich bread, spread butter on it and cover it with chocolate sprinkles. I am not sure though, if they have this for "merienda" or for breakfast. Dutch community, feel free to enlighten us! Cuando era pequeña solía tomar pan con chocolate para merendar. Los españoles sabrán a lo que me refiero... unas cuantas onzas de chocolate metidas en un trozo de pan. No hay combinación más sencilla y a la vez más deliciosa. He descubierto que aquí en Holanda ellos han llevado esta "delicatessen" a un nivel más sofisticado. Toman una rebanada de pan de molde, untan mantequilla y la cubren con virutas de chocolate. No estoy segura de si lo toman para merendar o para desayunar. Si algún holandés quiere echar luz sobre este asunto, ¡bienvenido sea! When I was working several months in French Guiana in 2007/2008, one of my French colleagues asked me to bring hagelslag in one of the trips. He was also resident in Holland and was missing them mixed with yoghurt for breakfast. Try it, it's also a good combination! Barba Larga - That is making your own "straciattela yoghurt", hehe!!!! I like that!! !